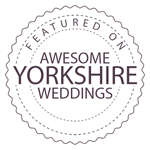 Did you get married in Yorkshire? Would you want to showcase your wedding or engagement session on our blog? We’d love to hear from you and spread the word about your big day! We accept submissions from brides and grooms as well as from photographers. Once your wedding pictures have been published on our blog copyright remains with the original author of the images. Please seek your photographer’s permission before submitting your wedding pictures. 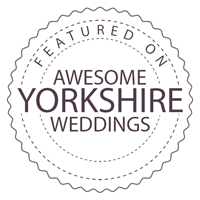 By submitting these images you are authorising them to be used for the real wedding feature and for potential further features on AwesomeYorkshireWeddings.co.uk website and our associated social media channels including but not limited to Facebook, Instagram, Twitter, Google+ and Pinterest. Of course you will be credited each each these images are used. Have you been featured on our blog? Copy the code below and display our badge on your website.